The auto-forwarding of carousels can be a problem, especially if they move too quickly. This means that customers can’t actually take in the information. Also, as this case study from Jakob Nielsen suggests, they also distract users from other elements on the page. Let’s say you see a great jacket, or a particularly enticing offer when you load up the homepage, but then it changes. So how do you get back to the image you wanted to see? Maybe it’s just me, but unless I see a particularly compelling image or message, I ignore carousels, as I haven’t the patience to wait for them to change. In fact, it’s a Catch 22 situation. If they move too quickly, you miss the messages; if they are slower, then customers become impatient waiting for the next one. The challenge with a landing page, whether a homepage or (sub)category page is getting your key messages across to 100% of your visitors. It’s akin to the visual merchandising challenge of a shop-front, with the differentiation being technology. Carousels seem like the best catch-all solution and have a wide adoption throughout however I personally think it is an inefficient use of space with a huge reliance on a consumer ‘sticking around’ if the first one or two banners do not appeal (assuming you have more than two). Carousels do sometimes seem a way to let various stakeholders each have a piece of homepage real estate, but the result is that three or four messages or promotions each recives less attention than they would without the carousel. There is also, as Jakob Nielsen points out, the problem of banner blindness. There have been a few studies into the effectiveness of carousels, and the results aren’t great. Here, Conversion XL sets out some compelling reasons to ditch them. The post references a study by Notre Dame university into its use of carousels. The five slides combined were only clicked on by 1% of site visitors, with the first slide bagging 84% of those clicks. Doesn’t seem worth it for the amount of homepage real estate devoted to them. I’ve set up tracking for quite a few of them. On the couple of occasions where they’ve gone from ‘no carousel’ to ‘carousel’, the carousel got less clicks than the static spot that was there beforehand. Where tracking’s been in place, the first slide has always, always got most clicks, even when ‘later’ slides have more compelling offers/content. The House of Fraser carousel switches about every five seconds, but since the slides are low on text, customers aren’t necessarily missing out on any messaging. This one moves quite quickly, every three or four seconds. Not much time to take in the code you need to use for the 20% discount. However, it does offer an alternative to the radio button nvaigation, with arrows either side of the sliders. The new Royal Mail website has a carousel, but it comes with plenty of navigation options. The redio buttons, arrows, and a pause button so people can actually read a slide they’re interested in. A unique approach from Topshop, while it has a carousel, it doesn’t move. Instead, customers need to use the arrows to move between slides. If they want to, that is. This certainly avoids the usability issues, and ensures that the main slide will get plenty of attention. Newegg has a carousel, but it only takes up a small area of the above the fold space. This avoids some of the drawbacks, while numbering the radio buttons gives a clearer indication to customers on how to navigate between slides. Should ecommerce sites use them? The evidence against them is convincing, and it’s interesting that most of the major US ecommerce sites aren’t using carousels, while roughly 50% of the top 20 UK retailers are. They’re good but, if you use them badly, they’re bad. Lots of the criticisms of them are easy to mitigate in a way that retains the benefits. For example, if you can display them differently to different user groups, that can work well. In general, sites make them move too fast. Most users suffer from banner blindness with the image heavy scrolling banners simply being ignored, because, in users’ minds they resemble adverts and too much effort is required to digest a “frame” before the next one is automatically presented. Even when a banner “frame” has grabbed a user’s attention, they quickly become frustrated when the content they are interested in moves off the page before they’ve had a chance to click on it. Nobody sits back and watches banners rotating in a carousel. Or, to be more precise, real users don’t do this. 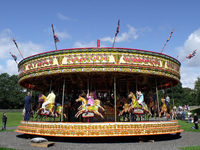 The internal stakeholders who signed off the carousel probably did, but that was their task. Real users want to get on with finding content or products, not leaning back and watching pretty images scroll before them. The (user) jury is still out when it comes to carousels that don’t auto-scroll and allow users to control the movement between “frames” and seems to depend more on the type of content. But, auto-scrolling carousels are real “no-no” for site owners. The challenge with a landing page, whether a homepage or (sub)category page is getting your key messages across to 100% of your visitors. It’s akin to the visual merchandising challenge of a shop-front, with the differentiation being technology. Carousels seem like the best catch-all solution and have a wide adoption throughout, but I think it is an inefficient use of space with a huge reliance on a consumer ‘sticking around’ if the first one or two banners do not appeal (assuming you have more than two). What should replace the carousel? With the use of clever technologies available on the market we can target single banners to segmented users. Certainly a more tailored approach based on interest for known users (previously visited). For the new customer, test test test! One focused banner message will drive higher CTRs than a few unfocused banners. Serving 100% of your visitors is near-on impossible without knowing something about them yet there seems a self-persuasion with content managers that more choice is good = more clicks = more sales. It doesn’t work that way. Brands will have to work extra hard this year in order to win over consumers, and the key to doing this will be demonstrating everyday usefulness, authenticity and corporate ethics. From the continued impact of the GFC to the effect of technology on the path-to-purchase to the challenge of big data, marketers and brands have a lot on their plate in 2013. In my last blog I looked at why mobile and tablet optimisation was imperative to businesses. In the second blog of the series I’ll explore why the time is now to optimise and I will also provide you with two of my top four considerations for tablet and mobile optimisation. If you’re a frequent web user it’s inevitable that you will at some point have been asked to login to a site using your Facebook ID. It tends to be a popular option with publishers and content sites as it offers an easy way to expose their brand to a wider audience, however it’s not uncommon for ecommerce sites to ask customers to login using Facebook. That said, ecommerce sites offering a Facebook login are still in the minority. A study by Sociable Labs in September 2012 found that just 30 of the top 500 online retailers have implemented login with Facebook, which shows that the majority of ecommerce sites feel they are better off without it. But that doesn’t necessarily mean that a Facebook login option has no place in ecommerce. In fact, last year we published an infographic which showed that 40% of consumers prefer social logins over a guest account.